For as long as I can remember I have been making Death by Chocolate for New Year’s Eve. My family used to host a yearly dessert party and just before midnight, this gorgeous cake was cut. In 2014 I started a new tradition. I went out New Year’s Eve and decided to make Death by Chocolate for Thanksgiving when most of my family was together. In 2015 my oldest son came home for winter break and requested Death by Chocolate for his birthday dinner celebration. I have wanted to share it with you on Desserts Required for the past three years but couldn’t figure out how I could make it ahead, cut a piece for pictures and then serve it for the party. When I found out that my Sunday Supper family was kicking off 2016 in a big way and designating January as National Sunday Supper Month, I knew then that today was going to be the perfect day to finally share Death by Chocolate with you. Death by Chocolate is the signature dessert in the aptly named Marcel Delsaunier book, Death by Chocolate. 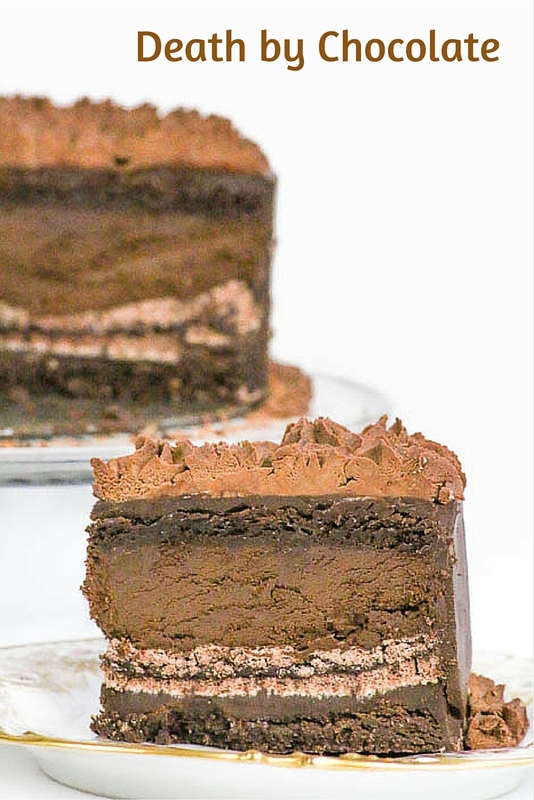 It is layered with a brownie, chocolate ganache, cocoa meringue, mocha mousse, another brownie, more chocolate ganache and, finally, topped with chocolate mousse. I serve it with Marcel Delsaunier’s Mocha Anglaise Sauce and it is heaven on earth. The first time I made Death by Chocolate, I was terrified. I mean, seriously, there are so many layers. Then I realized that all that I had to do was take it one step at a time. The cocoa meringue may be made a week ahead, the mocha anglaise several days out and the brownie, chocolate ganache and mocha mousse, the day before. Chocolate mousse is really easy to make the day of, so it boiled down to time management. The final cake is put together in a 9” springform and should be assembled 12 hours in advance. This works our perfectly because you will have time to relax before company arrives. Even though my New Year’s Eve plans changed, I know with 100% confidence that my Death by Chocolate fix will be satisfied. After all, any day that ends in ‘y’ is the perfect day to serve Death by Chocolate. Click below for your very own copy of Death by Chocolate…. Click below for your very own 9″ sprinform pan…. Click below for your very own set of 9″ cake pans…. Preheat the oven to 225º. Trace an 8" cake pan onto a piece of parchment paper. Flip the paper over and set aside. Place the egg whites, cream of tartar and salt into a large mixing bowl fitted with a wire whisk. Beat on medium speed until soft peaks form. Gradually add 1 cup (7.50 ounces) sugar, with the mixer running. Beat on high until stiff peaks form. Remove from the mixer and fold in ¼ cup (1.80 ounces) sugar, cocoa powder and cornstarch. Transfer the meringue to a gallon size freezer bag. Seal the bag and cut off a ¾" piece from one of the bottom corners. Squeeze a small amount of meringue under the four corners of the parchment paper to keep it in place. Starting in the middle of the traced circle, pipe in a circular manner to fill the circle. Be sure to stay within the traced line. Bake at 225º for 15 minutes. Reduce the temperature to 200º and bake an additional 2 hours and 45 minutes. Remove from the oven and cool completely. If making the cocoa meringue ahead of time, wrap well in plastic wrap. Preheat the oven to 325º. Butter a 9" cake pan and line it with parchment paper. Set aside. Place the butter, unsweetened chocolate and semisweet chocolate into a microwave safe bowl. Microwave just until melted. Stir until thoroughly combined. Place the eggs, sugar and vanilla into a large mixing bowl. Beat until light and fluffy. Add the melted butter/chocolate mixture followed by the dry ingredients. Blend in the sour cream. Transfer the batter to the prepared pan. Bake at 325º for 30 minutes. Remove from the oven and cool for 5 minutes. Use a small metal spatula to gently go around the edge of the pan. Turn the cake onto a 9" or 10" cake board and refrigerate for 20 to 30 minutes. Use a serrated knife to cut the cake in half horizontally. Gently transfer the top half to a second 9" or 10" cake board. Refrigerate until ready to assemble, wrapping in plastic wrap if the brownie was made a day in advance of assembly. Place the semisweet chocolate, unsweetened chocolate, water, coffee and cocoa powder into a large microwave safe bowl. Microwave just until melted. Stir until thoroughly combined. Cool completely before continuing. Place the egg whites into a mixing bowl fitted with a wire whisk. Beat on medium speed until soft peaks form. Gradually add sugar, with the mixer running. Beat on high until stiff peaks form. Set aside. Place the cream into a mixing bowl fitted with a wire whisk. Beat on medium speed just until stiff peaks form. Fold in ¼ of the egg whites to the cooled chocolate mixture. Fold in the whipped cream followed by the remaining egg whites. Set aside at room temperature. Place the chocolate into a large bowl. Set aside. Place the butter and whipping cream into a small saucepan. Bring to a simmer and pour over the chocolate. Allow the mixture to stand for 5 minutes before gently stirring until the ganache is smooth. Set aside. Place the chocolate into a large microwave safe bowl. Microwave just until melted. Stir until thoroughly combined. Cool completely before continuing. Whisk ⅓ of the whipped cream into the cooled chocolate mixture. Fold in the egg whites followed by the remaining whipped cream. Refrigerate if not using immediately. Place the semisweet chocolate, unsweetened chocolate and coffee into a large bowl. Set aside. Place the cream, milk and ¼ cup (1.85 ounces) sugar into a small saucepan. Bring to a boil. While this mixture is heating up, whisk together the egg yolks, remaining ¼ cup (1.85 ounces) sugar and cornstarch in a medium size bowl until light and fluffy. Pour the boiling mixture into the egg mixture and stir gently to combine. Pour this back into the saucepan and cook until it reaches 185º. Immediately pour over the chocolate mixture and stir until the chocolate is dissolved. Continue to stir periodically until the sauce has cooled. Add the vanilla. Refrigerate. Use the base of a 9" sprinform to trim the cocoa meringue. It must fit within the 9" springform pan. Place a closed 9" sprinform pan on a baking sheet. Transfer one of the brownie layers onto the bottom of the springform. Top this with 1½ cups (13.85 ounces) chocolate ganache. Gently place the cocoa meringue over the ganache. If need be use a couple of spatulas to help transfer the meringue. If the meringue breaks piece it together in the pan. Gently press down to release air pockets. Transfer the mocha mousse onto the meringue and smooth the top. Place the second brownie layer over the mocha mousse, bottom side up. The cake may be frozen for up to 24 hours at this point. Wrap tightly with plastic wrap. Set aside a cake plate. 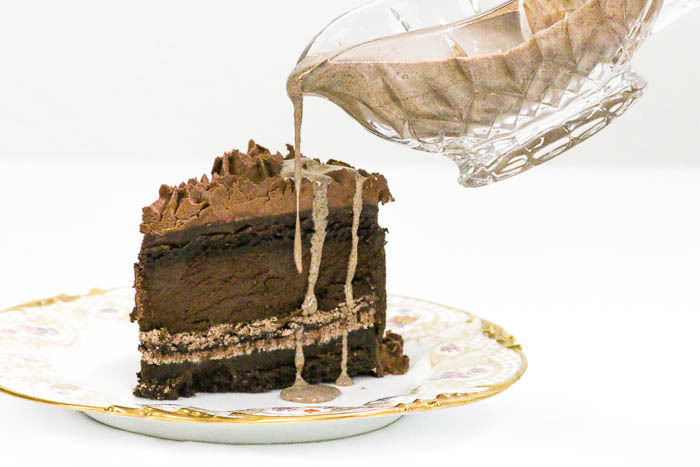 If serving Death by Chocolate from the bottom of the springform, put packing tape in the middle of the cake plate. This will keep the pan from sliding. Remove from the freezer. Release the handle of the pan. Use a small metal spatula to go around the edge of the pan then release the side. Remove the side of the pan by lifting the cake up and sliding the side down. Transfer to the cake plate. 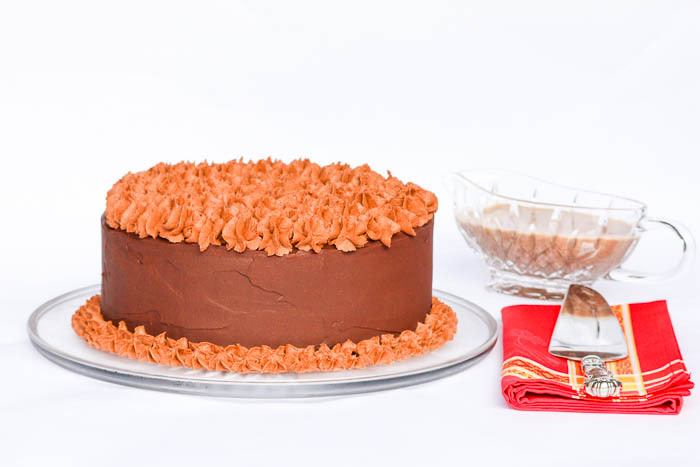 Use an angled metal spatula to spread the remaining ganache over the top and sides of the cake. 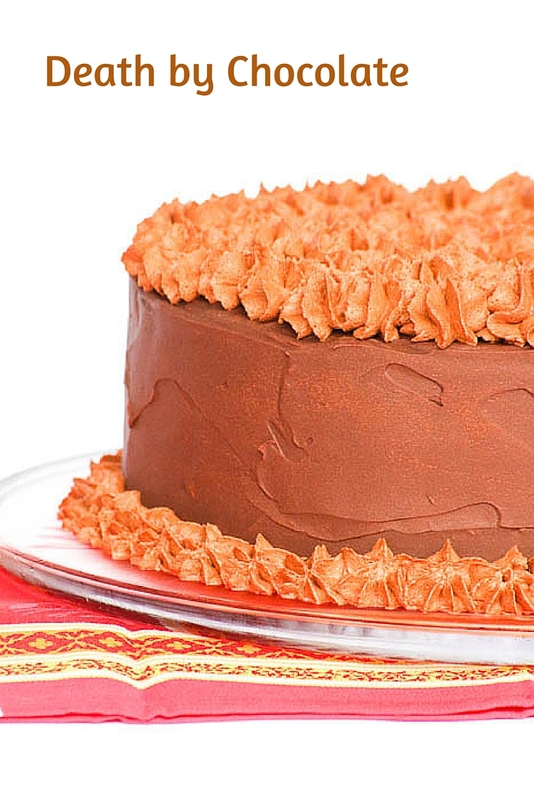 Work quickly and efficiently as the chocolate ganache will set very quickly on the frozen cake. The cake needs to be assembled to this point between 12 - 24 hours before serving. At least 4 hours before serving transfer the chocolate mousse into a gallon size freezer bag fitted with a large star tip. Pipe large stars over the top of the cake, starting on the outside and working towards the center. Pipe smaller stars around the base of the cake. Refrigerate. I hold an ice cube for a few minutes before piping the chocolate mousse so that it does not melt. Remove from the refrigerator for 2 hours before serving. Run a thin sharp knife under hot water and dry before slicing. Serve with mocha anglaise sauce. 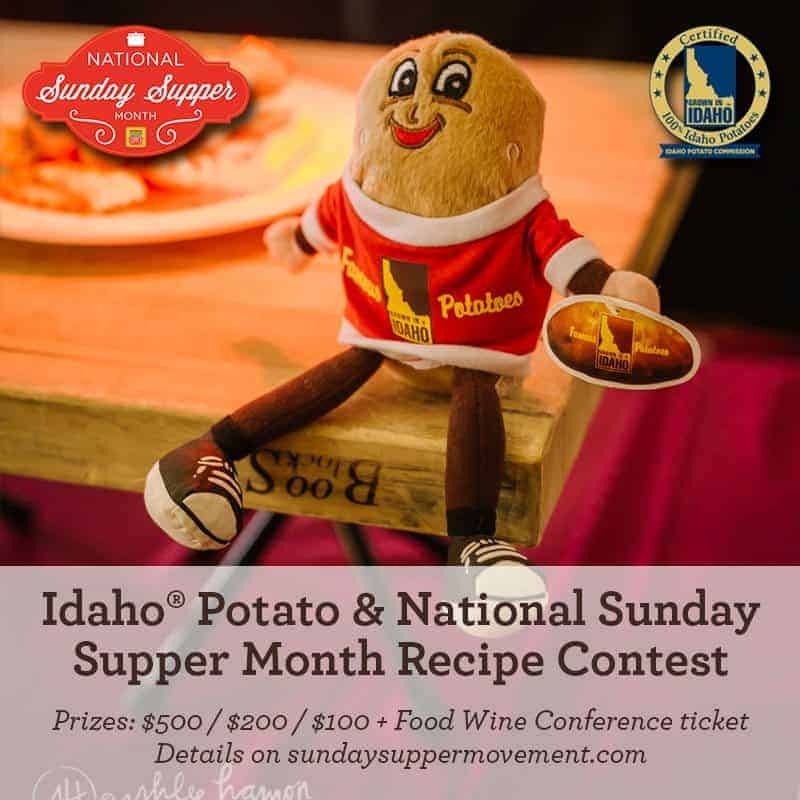 Please be sure to check out all of the other wonderful recipes from my Sunday Supper family. Oh, man, Betsy! This is a LOT of work, but I am sure it’s worth it! It sure is gorgeous! I’ve made this a number of times, too (I bet you’re not surprised!). I remember adding up the number of eggs, amount of cream and pounds of chocolate when I put it on the blog! You’ve made me want to make it again—maybe when Nick graduates 🙂 It’s definitely a show stopper!!! Yours is gorgeous!!! I am not surprised in the least little bit. I did not want to add everything up…..I just wasn’t sure I could count that high! This would be the perfect cake to make for Nick’s graduation and your cake will be incredible, my very talented friend! This is intense in the very best possible way! It is and with your gluten free talents, you can easily switch the brownies and enjoy the entire cake! I have that book and adore it–Marcel is the Man! You more than do his cake proud, Betsy, and I love that it has become a part of your family’s tradition! That is one awesome cake! I bet people go crazy over it whenever you serve it. They really do which and fortunately I have the timing down so that I am not exhausted by the time we sit down to enjoy it! Oh wow! Love those layers! Such a beautiful cake. Truly a slice of heaven! Gorgeous! Worth dying for!!! What a fabulous way to start the year, Betsy!! Thanks, Susan and I agree!! Oh my….that is an award winning cake right there!! Incredible!! You’re right, it doesn’t have to be intimidating if you divide and conquer. Thanks so much for your comments, Lauren! Gorgeous. I don’t care how many steps this takes, I HAVE to have this cake. I’m sure mine won’t be as pretty as yours but thanks to your directions I’m sure it’ll taste as good as yours looks.